If there is something that generates headaches, that is tax payments. Seeing how part of the revenues we generated ourselves vanish automatically is something we all want to avoid. And, even though that task is not 100% doable, the Spanish law creates some great opportunities available to us that we should not dismiss. 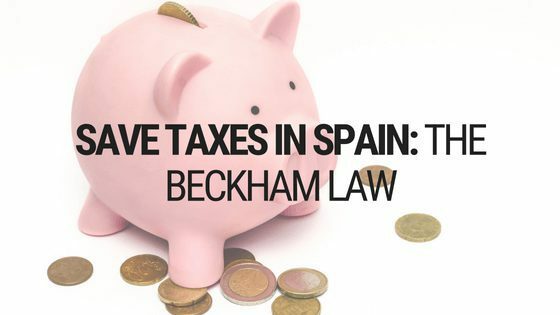 Like this, today we are presenting to you the Beckham Law, a huge advantage to save taxes for those expats that want to come back to work in Spain. What does the Beckham Law consist of? This normative, regulated on the section number 93 of the Spanish Income Tax Act, allows all the workers who reside abroad that want to come to work in Spain to pay income and wealth tax as if they were non-residents during the first 6 years. We are facing a measure which main purpose is to attract talent and qualified workers into Spain. How does the law pursue this incentive? Those individuals who start working in Spain will tribute at a fixed 24% rate up till the amount of 600.000€. In the case that income exceeds the top amount, the worker will be charged a fixed type of 45%. The Beckham Law implies, without any, doubt a great advantage for tax savings, as the flat tax rate of 24% is much lower than the rates that Spanish residents do face, which can rise up to 45%. If you want to learn more about the Spanish taxation system, do not hesitate to visit our post regarding which are the taxes paid in Spain in 2019. Furthermore, another of the upsides of this non-resident income tax is the application to the inheritance and donations tax as if the individual was a Spanish resident. Capital gains are not exempt either. Dividend gains, as well as profits obtained through the sale of both movable and immovable properties, will be charged at a fixed rate of 19%. Under this special regulation for foreigners, the property tax will only be applied to properties held in Spain. Therefore, a wealth tax in a portfolio of 3 million will only amount to approximately 1.79%. As you can see, taxes do have a lot of nuances, so learning all the details is key if you want to optimize your taxes in Spain. The Beckham Law also has its disadvantages. The worker will be forced, in addition to paying taxes for the income generated in Spain as we have previously mentioned, to pay for those generated worldwide. Taxation in the country of origin depends on the legislation of that territory, so it will vary among states. In addition, the existence of conventions and agreements between Spain and the country of origin will also have a relevant impact. This regulation is applicable, as we have indicated, for expatriate (expats) workers. But, also, for those individuals who come to Spain to work as administrators. In this particular case, the administrator can not have more than 24% of the company for the law to be applicable and thus benefit from tax savings. Another important requirement is the need to inform the competent authority. In this case, the worker must inform the Spanish Tax Administration within a period no longer than 6 months after arriving in Spain. Finally, the application of the expats regulation will only be valid for a period of 5 years maximum for the worker. Then you can welcome the Beckham Law. Summing up, this regulation allows imposition reductions of up to 20% in personal income, in addition to a reduction of up to 5% in dividends, and the potential for reducing the wealth tax (depending on the characteristics of taxation in the country of origin). What do you think of this measure? If you see a great opportunity to save taxes in Spain and need help in the management and processing, do not hesitate to contact our team of international lawyers. We will be happy to help! I have moved to Spain in Jul 2018, and am interested in applying for the Beckham law provision. Can you please help me with details on the service, timelines and fees if you were to help me with this. I am happy to provide further information should you need. We would really appreciate if you could send us an email to info@balcellsgroup.com detailing your current situation, so a specialized lawyer can carefully analyze your situation and provide you with personalized assistance. Thank you very much for reaching out to us.